There are so many Scotch Thistles in the paddocks here - hardly surprising given each plant can produce as many as 20,000 seeds! The seeds are amazing, not just in terms of numbers but the fact that each one will remain viable in the ground for 20 years - and can germinate at any time of the year! 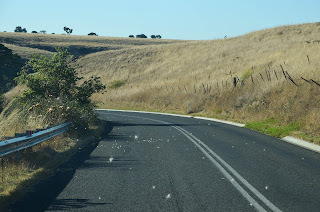 That's thistle fluff blowing across the road in the pic at right. It looks quite pretty and Vaughan has been keen to catch as many "wishes" as he can. Obviously there is no shortage of thistle down waiting to be caught! Seemingly though the thistle doesn't only spread from seed, it can grow from severed roots also. Actually after reading about all it's improvisations for survival, I'm surprised we don't see more of it than we do!